(AB4N): In 2004, Haicoole unveiled the California DeLorme Challenge. Many states have a DeLorme Challenge and now Georgia does too! In particular I would like to thank Moun10Bike for his work with the oft-copied Challenge guidelines, and the others who have contributed. I would also like to thank flyingmoose who encouraged me to set the Challenge up. Finally I would like to thank Groundspeak and all of the volunteers who work with us on these crazy ideas that we come up with. The DeLorme Atlas & Gazetteer is published for all 50 states. These maps are a favorite among travelers and outdoorsmen and are available at many locations, including online directly from DeLorme. 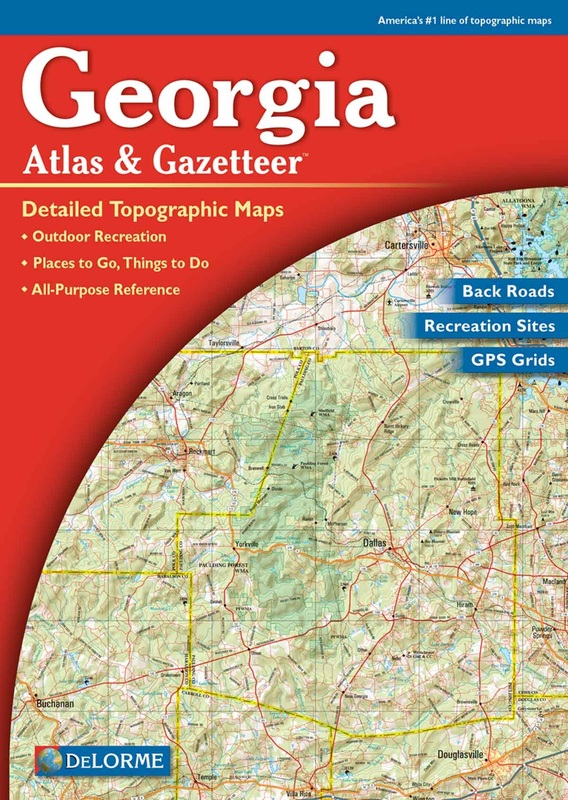 The goal of this cache is to find a cache on each page/map of the Georgia State DeLorme Atlas & Gazetteer; Georgia has 63 maps. This challenge will be what you make of it. The goal is really more than just finding a cache in each section of the atlas, it is also to tour and see the beautiful state of Georgia. So carefully plan and pick which caches you wish to hunt to maximize your return on investment! Hopefully the experience will make some long lasting memories. All finds must be confirmed. This can be done via a bookmark list or Project-GC challenge checker. We would prefer if each participant would create a bookmark list of the cache finds that they are using for the challenge, and update the list as you progress. Include this cache listing in your bookmark so that all bookmarks will be shown on the cache page. I will then be able to run a pocket query on the bookmark to verify your finds and create your progress maps which will be listed at the bottom of this page. Bookmarks are a premium member feature. If you are not a premium member and do not have access to Project-GC, you will need to send me a list of all of your finds. The list will need to contain the cache name, waypoint (GC#), coordinates, and the day you found it. The find cannot be logged until the physical container is found and the logbook inside signed. Finds logged without providing proof of completion will be deleted. The posted coordinates are not the actual coordinates for the cache. Generally accepted rules, guidelines, and conditions for logging a cache find apply. These must be bona fide caches listed on Geocaching.com that you have personally (physically) found and logged. Caches found prior to the creation of the Georgia DeLorme challenge will count only as long as all other Challenge requirements are met. If a page of the Georgia DeLorme Atlas & Gazetteer does not contain a cache at the time that you have completed the challenge and submitted your list then you may place a cache in that area to meet the requirement. This is the only time that a cache hide will count toward the Challenge. Any hides must meet Groundspeak requirements regarding vacation caches; in other words if you can not maintain the cache then you must provide the name of another person who is willing, is able, and will actually do it for you. (As of 12/7/2006 all maps have eligible caches to be found thanks to Hannah, Owl, and partners). If a Georgia DeLorme Atlas page includes space not located in Georgia, only caches in the Georgia portion will count. Online cache logs should include a statement that the cache was found as part of the Georgia DeLorme Challenge. We'd appreciated it if you will consider editing logs to include this statement on finds made prior to the challenge start and are being used to complete the challenge. In the outside edges of the maps in the latest edition of the atlas the grid coordinates are overlayed onto the map data. This area is a border, and outside of the GPS coordinate information provided on that map page. A cache will not count for the page if it lies in the border area, but instead can count for the map in which it is in the main map area. If this guideline is difficult to understand email me and I will try to further explain. A picture at each cache location is not a requirement, but would greatly be appreciated. Upload pictures to the individual cache logs, and feel free to upload favorite pictures of your adventure to this listing as well. When in doubt ask, we can discuss it or even seek guidance from others, but the final decision rests with the cache owner. Good luck, enjoy, and be safe. Remember that this is a game and is supposed to be fun! Congratulations to All of the Finishers of the Georgia DeLorme GeoChallenge - We hope you enjoyed visiting and learning about our wonderful state!! !